June 6th we ventured on to the longest of the Great Walks 79km! The Heaphy Track is a popular tramping track in the north west of the South Island of New Zealand. It is located within the Kahurangi National Park and classified as one of New Zealand’s nine Great Walks by the Department of Conservation. Named after Charles Heaphy, the track is 78.4 kilometres (48.7 mi) long and is usually walked in four or five days. The track runs from Kohaihai, north of Karamea on the northern west coast of the South Island to the upper valley of the Aorere River, inland from Golden Bay. We ran it in the other direction from Golden Bay to Kohaihai. 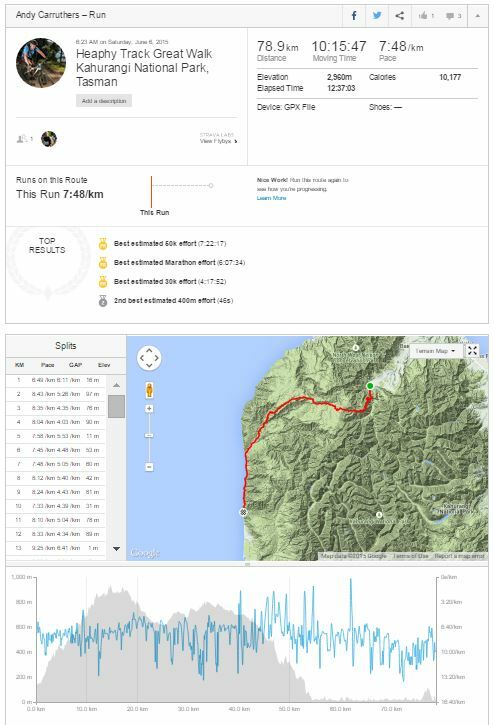 This was the toughest of the runs to arrange, we needed to ship a pack of dry clothes to Karamea a week before for after the run. We had to stay at Brown Hut at the start of the track because we had to start running at 6am, Brown hut is a freezing cold hut in June and the fireplace didn’t produce much heat at all. It was warmer outside the hut in the morning than inside. We had great service from Golden Bay Air who we flew with and arranged the transfers of our bags, to Karamea and the pick up of our pack from Brown Hut after we started our run. They also arranged our pick up Kohaihai complete with a few cold beers! Even Speights tastes great after 79km. We ate and stayed at the Karamea Hotel after the run, the steak was great and the breakfast was fantastic, a complete flied breakfast, eggs, bacon and sausage . True rural kiwi hospitality. We flew back from Karamea over the Track the next day, it was a beautiful day and magic to see the country we had covered the day before. Māori tribes are known to have settled along the lower course of the Heaphy River as early as the 16th century. Evidence has been found that the area crossed by today’s Heaphy Track had been explored in pre-European times by Māori seeking greenstone (pounamu) in the Gouland Downs sector. The first visit to the area by persons whose names were recorded took place in 1846, when Charles Heaphy, Thomas Brunner and their Māori guide Kehu, supported by another guide Etau, explored the coastal sector of the track. The first recorded crossing of the whole range approximately along today’s was by a European gold miner named Aldrige in 1859. Another visit by James MacKay and John Clark took place the following year. During and after the West Coast Gold Rush of the 1860s the area was extensively visited for gold and the track was definitely laid out by various prospectors and surveyors, among them JB Saxon in 1888. No gold was found in the area and after thirty years prospecting came to an end and by 1900 the track was virtually forgotten and became overgrown and seldom used except by an occasional hunter. The creation of the North-west Nelson Forest Park in 1965, which became Kahurangi National Park in 1996, led to the rediscovery and improvement of the track. The track is now tramped by thousands of people every year. The Heaphy track is renowned for the variety of landscapes crossed; every 20 km section is significantly different from the previous one. Walking the path east to west, the journey begins through a forest where beeches (Nothofagus) are dominant. Some zigzags lead to the highest point of the track, at 915 m, with good views to the surrounding mountains. From there on, tussocks replace forests, and the Gouland Downs are entered soon, a large featureless area drained by many rivers, with swingbridges helping to cross them when they are in spate. Now woody patches regain over tussock moors; near Gouland Downs Hut, beeches covered by thick moss are reminiscent of the wettest forests of southern New Zealand. After several kilometers of alternating tussock downs and bush, MacKay Hut is reached, with broad views reaching to the Tasman Sea. There begins a long descent through the bush. This time podocarps are dominant, including impressive large rimu trees. At the end of this descent, the Heaphy River valley is reached at Lewis Hut. The river course is followed for 8 km of peaceful flat walk, crossing the Heaphy River and several affluents on long swingbridges. This leads to discovering the nikau palm forest, which is probably the most striking feature of the Heaphy Track. The seashore is reached at Heaphy Hut, at the mouth of the Heaphy River. The last section is a coastal walk, alternating sandy beaches beaten by the waves and forest sections, where nikau palms dominate. Repeated attempts, from the 1950s to the 1980s, by the South Island Local Bodies Association to have the Ministry of Works build the road were made. The Ministry considered the road proposal to be too expensive and did not view it as a priority. The famed coastal strip with its iconic nikau palm groves was particularly at risk with any road construction. Even with simple track construction at Crayfish Point many years ago, the overall effect was to see major slips carry the groves into the sea. Those fighting roading proposals felt this could be the result along the very narrow, palm-covered coastal strip if road construction were to take place. Up until the 1980s the threats to the track were real, as the local population and councils largely supported roading in the belief that a “tourist circuit” of the South Island would increase the access and popularity of the area. The track proponents argued the damage could never be justified and that the popularity would come more in the form of people being drawn to the area for days rather than those who would drive through and use “comfort stops”. The campaign to “save” the Track and the popular support the conservation effort gathered over many years became pivotal in changing the attitude of the authorities to environmental matters. The New Zealand Government instigated many changes to curb unnecessary environmental destruction. Following the major campaigns, track use grew substantially. Of more recent times track use has moderated to a point where it now forms an integral part of the great New Zealand walking experience. As the popularity increased, more resources were put into track maintenance and facilities. Today, the track is well defined and serviced and capable of being walked by a wide age group. A number of commercial operators now provide guiding facilities and packing ability, thus allowing a wider age group to enjoy this extended walk. Before the area became a National Park mountain biking was permitted on the track. As a National Park use of the area comes under the National Parks Act 1980, which stipulates that vehicles are not allowed to be taken off formed roads. This prevents mountain bikers from using the track and debate has been on-going to allow at least some access. The New Zealand Conservation Authority decided to permit mountain bike access again from May 2011 for the winter months when tramping numbers are low. Mountain biking will be allowed each year from 1 May for groups not exceeding six riders.